● «Tonophone Record» in Berlin. The company was recently created in St.-Petersburg, director – K. Mazel. The company is going to undertake original recording on a large scale of the best metropolitan artists. «The Gramophone World» No. 1, January 1910. The company «Zwukopis» has introduced a novelty for its records labels. The banal circle is replaced with rectilinear rhombus. «The Gramophone Life» No. 7 of June 1, 1911. ● The representative of new foreign company that sells its records under «Zwukopis» Label has recently managed to record the famous bass S. Shumov who is the exhibitioner of the highest musical institution in Russia and possessing a voice of very beautiful and pleasant timbre; also known in the Petersburg’s musical life 13 years Kate Sorokina. The young singer possess pleasant contralto and rich timbre, she performs romances with great skill and feeling. Her 15 years brother Serge accompanies her on guitar. «Zwukopis» issued its first records. «The Gramophone World» No. 12, of June 25, 1911. ● The article appeared in «The Gramophone World» magazine about connection of Mr. Treves to the new «Zwukopis» Label has no grounds. Mr. Treves has signed a contract with the named Label on certain preferential terms taking an obligation to sell at least 50,000 records of this company. The company«Zwukopis» took advantage of staying in Petersburg priest Iliodore and recorded his voice on two records. «The Gramophone Life» No. 8 of July 1, 1911. ● In some Petersburg shops there appeared new records of «Zwukopis» Label that makes impression of decent appearance. Unfortunately, we did not have a chance to see the catalog of this Label, so we do not have possibility to make our opinion about its repertoire as well as artistic qualities of its records. «The Gramophone Life» No. 10 of August 15, 1911. ● The company «Zwukopis» began to sell first several records that by unanimous sellers responses can be considered as very successful ones. «The Gramophone World» No. 15 of August 15, 1911. ● The company «Zwukopis» is apparently busy with pressing of «child prodigy» records. 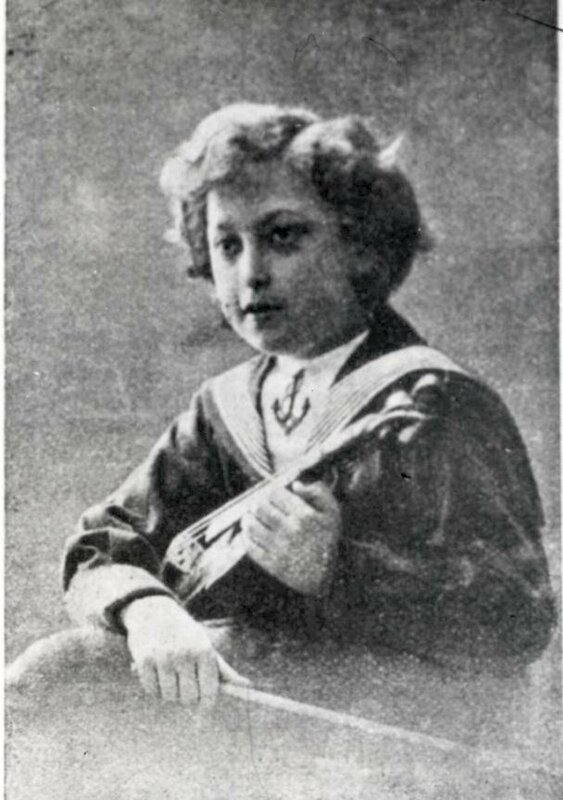 After issuing successful records of 13 years old gypsy singer Kate Sorokina and 10 years old violinist Jascha Heifetz the company recorded princess V., who is a wonderful elocutionist and recite. These records someday soon will appear on market. «The Gramophone World» No. 19 of October 15, 1911. ● The 13 years old gypsy singer Kate Sorokina signed two years contract for exclusive performance of her repertoire on «Zwukopis» Label. Recently this Label remarkably successfully recorded talented artist Yuri Morfessi. He performed 20 Russian genre songs. «The Gramophone World» No. 21 of November 15, 1911. 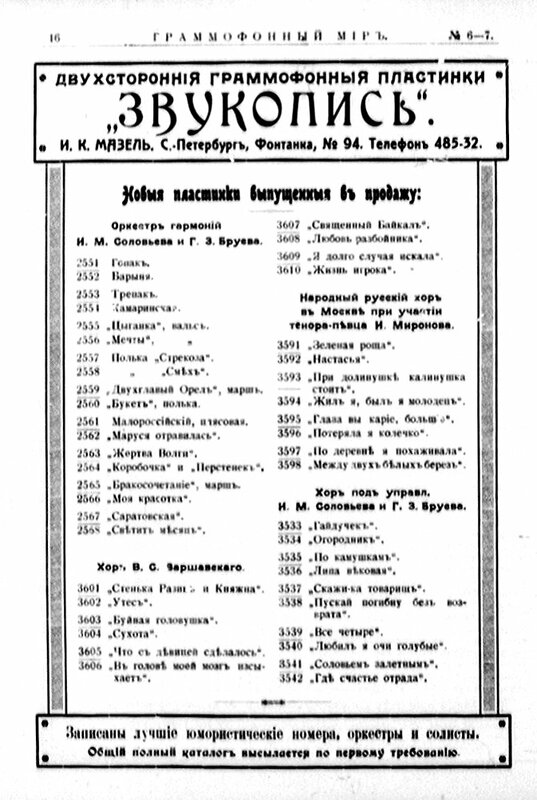 ● Among recently issued gramophone catalogs, draws attention the first catalog of «Zwukopis» Label owned by I.K. Mazel. The «Zwukopis» catalog is diverse and interesting with account on satisfaction of various gramophone record lovers – from arias and symphonies to popular orchestras and comic tales inclusively. «The Gramophone Life» No. 8 of February 15, 1912. ● The company «Zwukopis» with exceptional persistence continues to issue «hits» of the season. After notorious «The Rose», Label presented new smash hit «Caroline» with a very spicy lyrics performed by B.Z. Pronsky. «The Gramophone World» No. 5 of March 1, 1912. ● The great and unexpected success of striking «Zwukopis» records of B.Z. Pronsky encouraged Mr. Mazel to record 20 more numbers of this talented singer. His last hit the cabaret song «Mistress» enjoys the colossal success. «The Gramophone World» No. 7 of April 1, 1912. «The Gramophone World» No. 11 of June 25, 1912. ● Currently, the most operable pressing plant in Petersburg is «Zwukopis» that works in two shifts night and day barely keeping pace with numerous orders of its customers. «The Gramophone Life» No. 28 of July 10, 1912. ● Since September 1, 1912 «RAOG», «Zwukopis» и «Pathe» records became to appear with already affixed stamps. «The Gramophone World» No. 15 of September 20, 1912. ● S.A. Zhitlovsky recorded for «Zwukopis» Label remarkably successful famous Girnyak and Sham chorus. «The Gramophone World» No. 16 of October 10, 1912. ● Nothing lasts forever – Mr. Zhitlovsky left Mr. Mazel and no more plays active role in «Zwukopis» Label. Technician Mr. Krechmer remains working for Mr. Mazel and continues to make new successful records. «The Gramophone World» No. 1 of January 10, 1913. ● I. Mazel currently records for his «Zwukopis» Label. In front of the horn are folk singers and accordionists. «The Gramophone World» No. 2 of January 25, 1913. ● The gramophone technician Mr. Krechmer invented a special kind of film, i.e. a reel with wax ribbon that holds up to 50 minutes of recording. «The Gramophone World» No. 3 of February 10, 1913. ● I. Mazel went on tour to Moscow for recording of new folk repertoire. «The Gramophone World» No. 5 of March 15, 1913. ● ...They say that I. Mazel is about to undertake a new huge Russian recording and allocated for it... 85 Rubles. The scale is very large. They are going to invite Chaliapin, Caruso, Battistini, and, if the conditions will be suitable, Lina Cavalieri. «The Gramophone World» No. 6-7 of April 5, 1913. ● In expectation of special benefits from the upcoming syndicate, the owner of «Zwukopis» Label Mr. Mazel beforehand stopped advertisements of all new records, catalogs printing and even laid off his gramophone technician Mr. Krechmer. 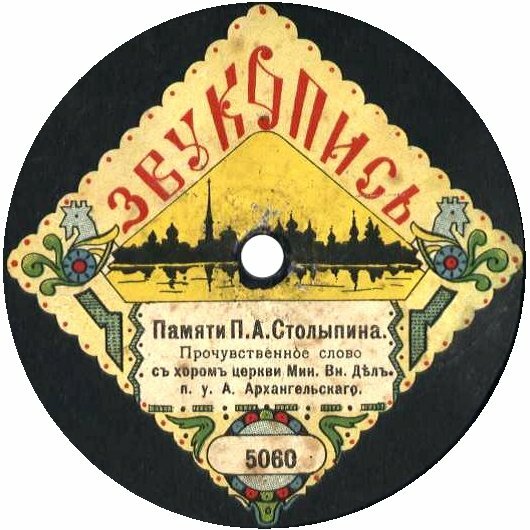 The later one equipped a new pressing plant now and going to start records pressing for the Petersburg market in the nearest future expecting to issue 400 – 500 discs daily. «The Gramophone World» No. 17 of November 7, 1913. ● From German citizens in Petrograd remained only one technician Mr. Krechmer. «The Gramophone World» No. 11 of September 5, 1914. 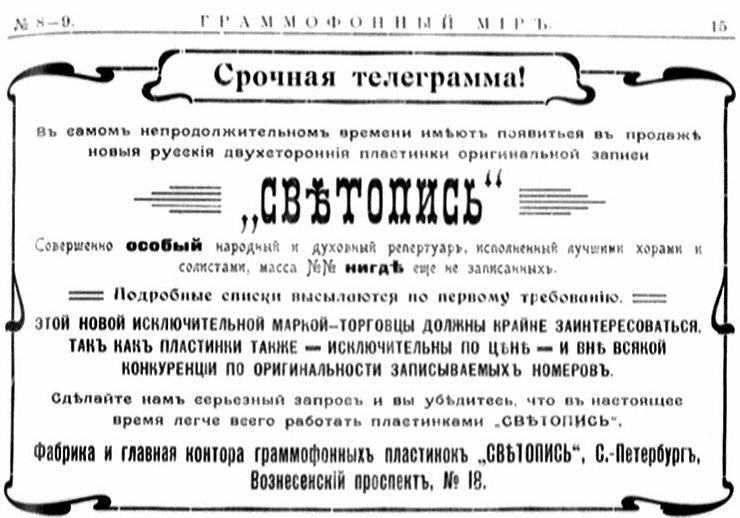 ● Currently, all gramophone technicians of German citizenship are expelled from Russia. The last one moved abroad Mr. Krechmer, so here remained only two-three specialists of Russian origin. Removing of German technicians absolutely did not affect the business. «The Gramophone World» No. 13-14 of December 1, 1914. ● «Zwukopis» merged with the Association of United Manufactures and ceased to exist independently. «The Gramophone World» No. 6-7 of June 15, 1916. 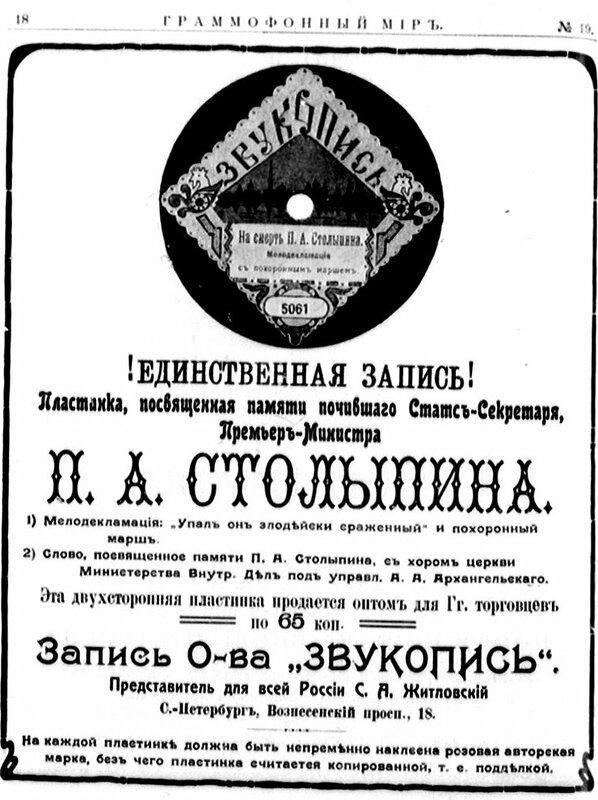 The advertisement from «The Gramophone World» magazine, No. 8-9 of April 20, 1911. As we see, the new label they originally planned to call «Swetopis» . From this advertisement from No. 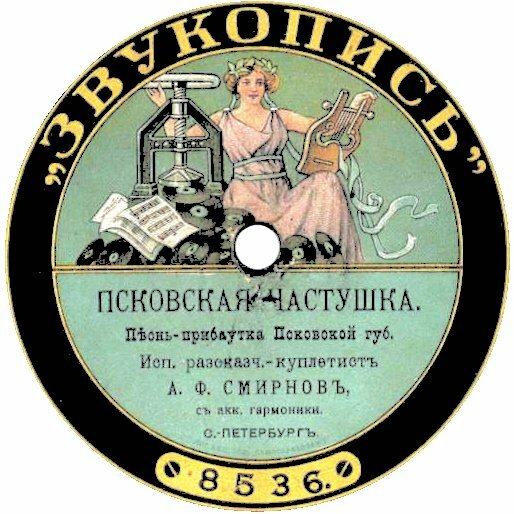 10 of May 20, 1911 of the same magazine one can conclude that the new label they decided to call «Zwukopis». 1001 Орк-ры А.Н.Семёнова и А.В.Ружека «Преображенский марш». 1002 Орк-ры А.Н.Семёнова и А.В.Ружека «Президент Фальер», марш. 1003 Орк-ры А.Н.Семёнова и А.В.Ружека «Кобзарь», новый малороссийский марш. 1004 Орк-ры А.Н.Семёнова и А.В.Ружека «Украинский марш», Садовский. 1005 Орк-ры А.Н.Семёнова и А.В.Ружека «Тоска по Родине», марш Кроупа. 1006 Орк-ры А.Н.Семёнова и А.В.Ружека «Тоска о прошлом», марш А.Емельянова. 1007 Орк-ры А.Н.Семёнова и А.В.Ружека Марш из оп-ты «Добродетельная грешница», Жильберта. 1008 Орк-ры А.Н.Семёнова и А.В.Ружека «»Король веселится», полька-марш из оп-ты «Ромео и Джульетта». 1009 Орк-ры А.Н.Семёнова и А.В.Ружека «Милый Саша», марш с пением . 1010 Орк-ры А.Н.Семёнова и А.В.Ружека «Кушка», марш с пением, арр. Ружека. 1011 Орк-ры А.Н.Семёнова и А.В.Ружека «Мишутка весельчак». 1012 Орк-ры А.Н.Семёнова и А.В.Ружека «Весёлый кузнец», марш с пением. 1013 Орк-ры А.Н.Семёнова и А.В.Ружека «Полтавский бой», марш. 1014 Орк-ры А.Н.Семёнова и А.В.Ружека «Цеппелин», марш. 1015 Придв. орк. п/у Ф.Бернаки «Парижские мостовые», марш. 1016 Придв. орк. п/у Ф.Бернаки «Модная и Ева», марш. 1017 Орк. яхты «Штандарт» п/у Ф.А.Нимана «Шуми Марица», болгарский национальный гимн. 1018 Орк. яхты «Штандарт» п/у Ф.А.Нимана «Сербский национальный гимн». 1019 Орк. яхты «Штандарт» п/у Ф.А.Нимана «Черногорский национальный гимн». 1020 Орк. яхты «Штандарт» п/у Ф.А.Нимана «Греческий национальный гимн». 1021 Орк. яхты «Штандарт» п/у Ф.А.Нимана «Марш Королевича». 1022 Орк. яхты «Штандарт» п/у Ф.А.Нимана «Греческий патруль». 1029 Оркестр «Полковой марш Л.-Гв. 2-го Конного Стрелкового Царского полка. 1030 Оркестр «От борьбы к победе», марш Блона. 1101 Орк-ры А.Н.Семёнова и А.В.Ружека «На сопках Манчжурии», вальс.И.Шатрова. 1102 Орк-ры А.Н.Семёнова и А.В.Ружека «Осенний сон», вальс Джойса. 1103 Орк-ры А.Н.Семёнова и А.В.Ружека «Дамы и Звёзды», вальс из оп-ты Дама в красном». 1104 Орк-ры А.Н.Семёнова и А.В.Ружека «Вальс из оп-ты «Граф Люксембург», Ф.Легара. 1105 Орк-ры А.Н.Семёнова и А.В.Ружека «Осенние мечты», вальс Рейдермана. 1106 Орк-ры А.Н.Семёнова и А.В.Ружека «Лесная сказка», Беккера. 1107 Орк-ры А.Н.Семёнова и А.В.Ружека «Вальс из оп-ты «Разведённая жена». 1108 Орк-ры А.Н.Семёнова и А.В.Ружека Вальс из оп-ты «Мисс Гиббс», Кирилль и Монктон. 1109 Орк-ры А.Н.Семёнова и А.В.Ружека «Скеттинг», новый вальс А.Чернявского. 1110 Орк-ры А.Н.Семёнова и А.В.Ружека «Изюминка», новый вальс А.Чернявского. 1111 Орк-ры А.Н.Семёнова и А.В.Ружека «Воспоминание», вальс А.Ружека. 1112 Орк-ры А.Н.Семёнова и А.В.Ружека «Вера», полька А.Ружека. 1301 Орк-ры А.Н.Семёнова и А.В.Ружека «Венгерка». 1302 Орк-ры А.Н.Семёнова и А.В.Ружека «Бальная лезгинка», Цармана. 1303 Орк-ры А.Н.Семёнова и А.В.Ружека «Па-де Эспань», Цармана. 1304 Орк-ры А.Н.Семёнова и А.В.Ружека «Бальный чардаш», Цармана. 1305 Орк-ры А.Н.Семёнова и А.В.Ружека «Крестьяночка», бальный танец И.Борисова. 1306 Орк-ры А.Н.Семёнова и А.В.Ружека «Коханочка», бальный танец Н.Яковлева. 1307 Орк-ры А.Н.Семёнова и А.В.Ружека «Краковяк», польский бальный танец. 1308 Орк-ры А.Н.Семёнова и А.В.Ружека «Па-Зефир», танец Н.Яковлева. 1309 Орк-ры А.Н.Семёнова и А.В.Ружека «Мазурка из оп. «Жизнь за царя», М.Глинки. 1310 Орк-ры А.Н.Семёнова и А.В.Ружека «Прошу, Сударыня», мазурка Н.Зубова. 1311 Орк-ры А.Н.Семёнова и А.В.Ружека «Дамский каприз», па-де-Катр. 1312 Орк-ры А.Н.Семёнова и А.В.Ружека «Конькобежцы». 1313 Орк-ры А.Н.Семёнова и А.В.Ружека «Плутовка», па-Зефир. 1314 Орк-ры А.Н.Семёнова и А.В.Ружека «О1-ра, Ой-ра», полька Люстига. 1315 Орк-ры А.Н.Семёнова и А.В.Ружека «Тореадор», танец Н.Яковлева. 1316 Орк-ры А.Н.Семёнова и А.В.Ружека «Гиавата», Н.Морэ. 1317 Орк-ры А.Н.Семёнова и А.В.Ружека «Венгерка», Сивачёва. 1318 Орк-ры А.Н.Семёнова и А.В.Ружека «Через пень и колоду», галоп. 1319 Орк-ры А.Н.Семёнова и А.В.Ружека «Ки-ка-пу», новый танец. 1320 Орк-ры А.Н.Семёнова и А.В.Ружека «Весёлый негр», кэк-уок. 1321 Орк-ры А.Н.Семёнова и А.В.Ружека «Соловей», полька. 1322 Орк-ры А.Н.Семёнова и А.В.Ружека «Парагвай», танец. 1324 Орк-ры А.Н.Семёнова и А.В.Ружека «Фиалки», мазурка Эйленберга. 1339 Орк-ры А.Н.Семёнова и А.В.Ружека «Макарони». 1340 Орк-ры А.Н.Семёнова и А.В.Ружека Тоббаган». 1341 Орк-ры А.Н.Семёнова и А.В.Ружека «Цванцигер». 1342 Орк-ры А.Н.Семёнова и А.В.Ружека «Новый Па-д-эспань». 1381 Орк-ры А.Н.Семёнова и А.В.Ружека «Малороссийский казачёк». 1382 Орк-ры А.Н.Семёнова и А.В.Ружека «Малороссийский гопак». 1401 Орк. Кружка Любителей музыки «Весёлая гречанка», мазурка. 1402 Орк. Кружка Любителей музыки «Аэроплан», марш. 1403 Орк. Кружка Любителей музыки «Кабардинцы», мазурка. 1404 Орк. Кружка Любителей музыки Кароян», эстонский танец. 1751 Большой оркестр в Барселоне «Царица цветов», муз. Сардана. 1752 Большой оркестр в Барселоне «»Вздохи сердца», Сардана. 1761 Ксилофон с оркестром «Венецианский карнавал». 1762 Ксилофон с оркестром «Мельница в лесу». 1952 Струнное три п/у Викера «Элегия», Ж.Массне. 1953 Струнное три п/у Викера «Сомнение», М.Глинки. 1954 Струнное три п/у Викера «Не искушай», элегия М.Глинки. 1957 Струнное три п/у Викера «Аве Мария», Ф.Шуберт. 1958 Струнное три п/у Викера «Серенада-вальс», Цибульки. 2002 Яша Хейфец, скрипка «Юмореска», А.Дворжака. 2003 Яша Хейфец, скрипка «Серенада», муз. Дрдла. 2004 Яша Хейфец, скрипка «Воспоминание». Дрдла. 2005 Яша Хейфец, скрипка «Венская фантазия», муз. Ф.Крейслера. 2006 Яша Хейфец, скрипка «Романс», Ауэра. 2017 Костя Токаревич, скрипка «Ландышки». 2018 Костя Токаревич, скрипка «Серенада», Ш.Гуно. 2020 Зейлигер В.И., скрипка «Обертас», мазурка Венявского. 2021 Цецилия Ганзен, скрипка «Поэма», Фибиха. 2023 Цецилия Ганзен, скрипка «Вальс из балета «Арлекинада», Дриго-Ауэра. 2025 Цецилия Ганзен, скрипка «Венгерский танец № 5», Брамса. 2026 Цецилия Ганзен, скрипка «Венгерский танец № 1», Брамса. 2101 Лемос А.В., корнет «Пожалей», Н.Бакалейникова. 2102 Лемос А.В., корнет «Не брани меня, родная». 2103 Лемос А.В., корнет «Когда б вы поняли меня, Л.Денцы. 2105 Лемос А.В., корнет «Хризантемы», А.Радошевской. 2106 Лемос А.В., корнет «Когда б я знал», П.Козлова. 2107 Лемос А.В., корнет «Евгений Онегин», П.Чайковского. Ария Ленского. 2108 Лемос А.В., корнет «Арлекинада», балет Дриго. Серенада. 2109 Лемос А.В., корнет «Матушка, голубушка», русская песня. 2110 Лемос А.В., корнет «Снегурочка», Н.Римского-Корсакова. Песня Леля. 2111 Лемос А.В., корнет «Виють витры»; «У сусида хата била», малороссийские песни. 2112 Лемос А.В., корнет «Карие глазки»; «Маруся отравилась». 2113 Лемос А.В., корнет «Ах, зачем эта ночь», Ф.Садовского; «Любила Маруся». 2114 Лемос А.В., корнет «Москва». 2115 Лемос А.В., корнет «Чайка», Е.Жураковского. 2116 Лемос А.В., корнет «Жертва Волги». 2117 Лемос А.В., корнет «Концерт Берио». 2118 Лемос А.В., корнет «Концертная полька». 2119 Лемос А.В., корнет «Зачем», К.Давыдова. 2120 Лемос А.В., корнет «Бесприютная душа». 2121 Лемос А.В., корнет «Уголок», С.Штеймана. 2503 Орк. гарм. «Аккордеон» «Жизнерадостный марш». 2504 Орк. гарм. «Аккордеон» «Война», полька Петра Невского. 2506 Орк. гарм. «Аккордеон» «Ой-ра, Ой-ра», полька Лустига. 2507 Орк. гарм. «Аккордеон» «Осенние мечты», вальс Рейдермана. 2508 Орк. гарм. «Аккордеон» «Пожалей», Бакалейникова. 2509 Орк. гарм. «Аккордеон» «Китаянка». 2510 Орк. гарм. «Аккордеон» «Краковяк». 2511 Орк. гарм. «Аккордеон» «Очаровательные глазки», бальный чардаш. 2512 Орк. гарм. «Аккордеон» «Па-де Эспань», Цармана. 2513 Орк. гарм. «Аккордеон» «Бальная лезгинка», Цармана. 2514 Орк. гарм. «Аккордеон» «Новая венгерка», А.Чернавского. 2515 Орк. гарм. «Аккордеон» «Крестьяночка», танец Борисова. 2516 Орк. гарм. «Аккордеон» «Коханочка», танец Н.Яковлева. 2517 Орк. гарм. «Аккордеон» Казачёк», плясовая. 2518 Орк. гарм. «Аккордеон» «Ямщик»; «Ухарь купец», Ф.Садовского. 2519 Орк. гарм. «Аккордеон» «Ехал казак за Дунай». 2520 Орк. гарм. «Аккордеон» «Полтава»; «По улице мостовой». 2521 Орк. гарм. «Аккордеон» «Тоска по родине», марш Кроупа. 2522 Орк. гарм. «Аккордеон» «На сопках Манчжурии», вальс И.Шатрова. 2523 Орк. гарм. «Аккордеон» «Ласточка», итальянская пес ня. 2524 Орк. гарм. «Аккордеон» «Последний нынешний денёчек»; «Полянка». 2531 Орк. гарм. Я.Орланского-Титоренко «Казачёк», плясовая. 2532 Орк. гарм. Я.Орланского-Титоренко «У цыган», марш. 2533 Орк. гарм. Я.Орланского-Титоренко «Пчёлка», полька. 2534 Орк. гарм. Я.Орланского-Титоренко «Амурские волны», вальс Кюсса. 2535 Орк. гарм. Я.Орланского-Титоренко «Московская полька». 2536 Орк. гарм. Я.Орланского-Титоренко «Артиллерист», мазурка. 2537 Орк. гарм. Я.Орланского-Титоренко «Дни нашей жизни», марш Чернецкого. 2538 Орк. гарм. Я.Орланского-Титоренко «Украинский марш», Ф,Садовского. 2539 Орк. гарм. Я.Орланского-Титоренко «Тоска», вальс А.Пиккерт. 2540 Орк. гарм. Я.Орланского-Титоренко «Матросский танец». 2541 Орк. гарм. Я.Орланского-Титоренко «Камаринская», плясовая. 2542 Орк. гарм. Я.Орланского-Титоренко «Барыня», плясовая. 2543 Орк. гарм. Я.Орланского-Титоренко «Солнце всходит и заходит». 2544 Орк. гарм. Я.Орланского-Титоренко «Трансваль»; «Свадебная плясовая». 2545 Орк. гарм. Я.Орланского-Титоренко «Малороссийский гопак». 2546 Орк. гарм. Я.Орланского-Титоренко «Малороссийский казачёк». 2547 Орк. гарм. Я.Орланского-Титоренко «Бальный украинский казачёк». 2548 Орк. гарм. Я.Орланского-Титоренко «Чешская полька». 2549 Орк. гарм. Я.Орланского-Титоренко «Во саду ли, в огороде», с вариациями. 2550 Орк. гарм. Я.Орланского-Титоренко «В русской деревне», попурри. 2551 Орк. И.Соловьёва и Г.Бруева «Гопак». 2552 Орк. И.Соловьёва и Г.Бруева «Барыня». 2553 Орк. И.Соловьёва и Г.Бруева «Трепак». 2554 Орк. И.Соловьёва и Г.Бруева «Камаринская». 2555 Орк. И.Соловьёва и Г.Бруева «Цыганка», вальс. 2556 Орк. И.Соловьёва и Г.Бруева «Мечты», вальс. 2557 Орк. И.Соловьёва и Г.Бруева «Стрекоза», полька. 2558 Орк. И.Соловьёва и Г.Бруева «Смех», полька. 2559 Орк. И.Соловьёва и Г.Бруева «Двуглавый орёл». 2560 Орк. И.Соловьёва и Г.Бруева «Букет», полька. 2561 Орк. И.Соловьёва и Г.Бруева «Малороссийский», плясовая. 2562 Орк. И.Соловьёва и Г.Бруева «Маруся отравилась». 2563 Орк. И.Соловьёва и Г.Бруева «Жертва Волги». 2564 Орк. И.Соловьёва и Г.Бруева «Коробочка»; «Перстенёк». 2565 Орк. И.Соловьёва и Г.Бруева «Бракосочетание». 2566 Орк. И.Соловьёва и Г.Бруева «Моя красотка». 2567 Орк. И.Соловьёва и Г.Бруева «Саратовская». 2568 Орк. И.Соловьёва и Г.Бруева «Светит месяц». 2701 Каганов М., гармония «Суббота»» (Милаша молдаванка). 2702 Каганов М., гармония «Семь-сорок» (Восточнгая песня). 2703 Каганов М., гармония «Ветренная», народная песня. 2704 Каганов М., гармония «Малороссийский гопак». 2711 Каганов М., гармония «Тверская частушка». 2712 Каганов М., гармония «Бесконечная», всех губерний. 2802 Орк. балал. Алексеева В.А. «Сторона ль ты моя, сторонушка». 2803 Орк. балал. Алексеева В.А. «Ой-ра № 3», полька-марш. 2804 Орк. балал. Алексеева В.А. «Танец кошечек», Мюра. 2805 Орк. балал. Алексеева В.А. «Страничка из альбома», Э.Григ. 2806 Орк. балал. Алексеева В.А. «Колыбельная песня», Б.Годар. 2902 Богемский Д.А. «Упал он, злодейски убитый», мелодекламация. С орк. 2903 Богемский Д.А. 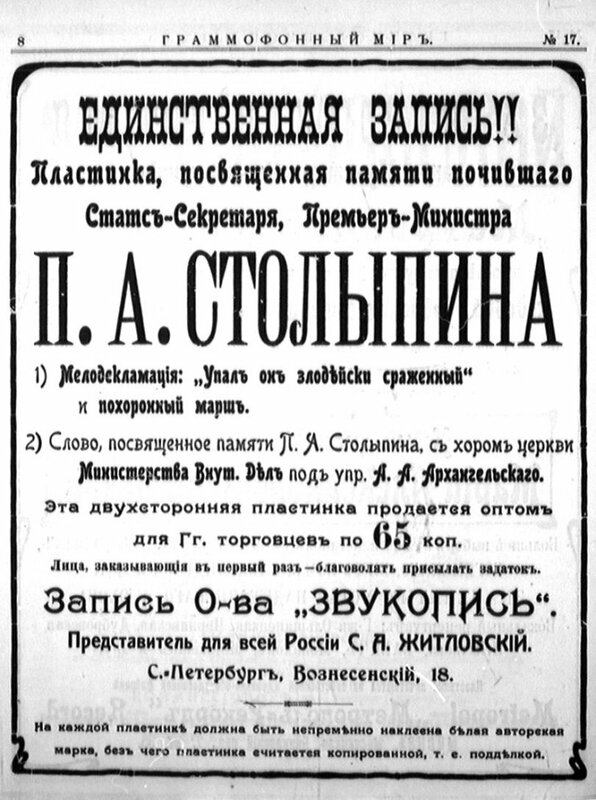 «За братьев славян», мелодекламация. С орк. 2904 Богемский Д.А. «На Балканах», мелодекламация. С орк. 2905 Вяземская Ксения «Стрекоза и одуванчик», стихотворение. 2906 Вяземская Ксения «Детский бал», декламация. 2907 Вяземская Ксения «Любимая кукла», декламация. 2908 Вяземская Ксения «Куколка», декламация. 3201 Дух. хор А.Архангельского «Христос воскресе», «Да воскреснет Бог», Д.Бортнянского. 3202 Дух. хор А.Архангельского «Ангел ьопияше», Д.Бортнянского. 3203 Дух. хор А.Архангельского «Пасхальные ирмосы» (Воскресения день). 3205 Дух. хор А.Архангельского «Иже херувимы № 7», Д.Бортнянского. 3206 Дух. хор А.Архангельского «Милость мира». 3207 Дух. хор А.Архангельского «Приидите поклонимися». 3208 Дух. хор А.Архангельского «Тебе поём». 3209 Дух. хор А.Архангельского «Верую», А.Архангельского. 3210 Дух. хор А.Архангельского «Верую», А.Архангельского (продолжение). Соло А.Суходольский. 3211 Дух. хор А.Архангельского «Ныне Отпущаеши», М.Строкин. 3212 Дух. хор А.Архангельского «Вскую мя», Рютова. Соло А.Суходольский. 3213 Дух. хор А.Архангельского «Достойно есть», А.Архангельского. 3214 Дух. хор А.Архангельского «Ныне отпущаеши», А.Архангельского. Соло А.Конаки. 3215 Дух. хор А.Архангельского «Дева днесь». 3216 Дух. хор А.Архангельского «Рождество твоё Христе Боже наш»; «Христос рождается». 3217 Дух. хор А.Архангельского «Задостойник Рождеству», П.Турчанинов. 3218 Дух. хор А.Архангельского «Слава в вышних Богу», Д.Бортнянского. 3219 Дух. хор А.Архангельского «Во царствие Твоём», древний распев, арр. А.Архангельского. 3220 Дух. хор А.Архангельского «С нами Бог», переложение Боща. 3222 Дух. хор А.Архангельского «Достойно есть», А.Архангельского. 3501 Хор Гирняка и Шама «Ой, батюшки, не могу», комическая. С орк. 3502 Хор Гирняка и Шама «Милая Дуняша», комическая. С орк. 3503 Хор Гирняка и Шама «Господу Богу помолимся», тюремная больница. С орк. 3504 Хор Гирняка и Шама «Ах ты доля, моя доля», песня горя. С орк. 3505 Хор Гирняка и Шама «Славанская весёлая калинка». С орк. 3506 Хор Гирняка и Шама «Чечётка», народная скороговорка. С орк. 3507 Хор Гирняка и Шама «Не осенний мелкий дождичек». С орк. 3508 Хор Гирняка и Шама «Вниз по матушке по Волге». С орк. 3509 Хор Гирняка и Шама «Отец скончался в тюрьме», песня тайги. С орк. 3510 Хор Гирняка и Шама «Лишь утро наступит», сибирская песня. С орк. 3511 Хор Гирняка и Шама «От павших твердынь Порт-Артура». С орк. 3512 Хор Гирняка и Шама «Песнь отставного солдата». С орк. 3513 Хор Гирняка и Шама «Песня Подольского кузнеца». С орк. 3514 Хор Гирняка и Шама «Как у нашего соседа». С орк. 3515 Хор Гирняка и Шама «Могила». С орк. 3516 Хор Гирняка и Шама «Сухая корочка» С орк..
3517 Хор Гирняка и Шама «Садочек». С орк. 3518 Хор Гирняка и Шама «На паперти Божьего храма». 3519 Хор Гирняка и Шама «Во поле берёза стояла». С орк. 3520 Хор Гирняка и Шама «Маруся отравилась». С орк. 3521 Хор Гирняка и Шама «Цумба, цумба». С орк. 3522 Хор Гирняка и Шама «Дубинушка». С орк. 3531 Хор А.А.Архангельского «Гей, словене, живио!» – общеславянский гимн. 3532 Хор А.А.Архангельского «Шуми, Марица», болгарский гимн. 3533 Хор И.Соловьёва и Г.Бруева «Гайдучёк». 3534 Хор И.Соловьёва и Г.Бруева «Огородник». 3535 Хор И.Соловьёва и Г.Бруева «По камушкам». 3536 Хор И.Соловьёва и Г.Бруева «Липа вековая». 3537 Хор И.Соловьёва и Г.Бруева «Скажи-ка, товарищ». 3538 Хор И.Соловьёва и Г.Бруева «Пускай погибну без возврата». 3539 Хор И.Соловьёва и Г.Бруева «Всё четыре». 3540 Хор И.Соловьёва и Г.Бруева «Любил я очи голубые». 3541 Хор И.Соловьёва и Г.Бруева «Соловьём залётным». 3542 Хор И.Соловьёва и Г.Бруева «Где счастье отрада». 3551 Хор Ф.Пономарёва «Преображенский марш». С орк гармоний. 3552 Хор Ф.Пономарёва «Ах ты батюшка, Ярославль-город». С орк. гармоний. 3553 Хор Ф.Пономарёва «Ах житьё, моё житьё». С орк.гармоний. 3554 Хор Ф.Пономарёва «Т оска по родине», марш Кроупа. С орк. гармоний. 3555 Хор Ф.Пономарёва «Ты взойди, солнце красное». С орк. гармоний. 3556 Хор Ф.Пономарёва «Ночи тёмные, тучи грозные». С орк. гармоний. 3557 Хор Ф.Пономарёва «Золотые, удалые», народная песня. С орк. гармоний. 3558 Хор Ф.Пономарёва «Шумел, горел пожар московский». С орк. гармоний. 3559 Хор Ф.Пономарёва «Среди долины ровные». С орк. гармоний. 3560 Хор Ф.Пономарёва «То не ветер ветку клонит».С орк. гармоний. 3592 Народный хор в Москве «Настасья», соло И.Миронов. 3593 Народный хор в Москве «При долинушке калинушка стоит», соло И.Миронов. 3594 Народный хор в Москве «Жил я, был я молодец», соло И.Миронов. 3595 Народный хор в Москве «Глаза вы карие, большие», соло И.Миронов. 3596 Народный хор в Москве «Потеряла я колечко», соло И.Миронов. 3597 Народный хор в Москве «По деревне я похаживала», соло И.Миронов. 3598 Народный хор в Москве «Между двух белых берёз», соло И.Миронов. 3601 Хор В.С.Варшавского «Стенька Разин и княжна». 3603 Хор В.С.Варшавского «Буйная головушка». 3605 Хор В.С.Варшавского «Что с девицей сделалось». 3607 Хор В.С.Варшавского «Священный Байкал». 3608 Хор В.С.Варшавского «Любовь разбойника». 3609 Хор В.С.Варшавского «Я долго случая искала». 3610 Хор В.С.Варшавского «Жизнь игрока». 3951 Ансамбль «Русская тройка» «Рябинушка», бытовая песня. 3952 Ансамбль «Русская тройка» «Ермак», былина. 3953 Ансамбль «Русская тройка» «Гуляла я в садочке», старинная песня. 3954 Ансамбль «Русская тройка» «Трень-брень, гусельки», исп. Троицкий и Володько. 3055 Ансамбль «Русская тройка» «На последнюю пятёрку». 3956 Ансамбль «Русская тройка» «Быстры как волны дни нашей жизни». 4001 Ершов Д. «Маруся отравилась», из Саратовского сборника песен. 4002 Ершов Д. «Замёрзшая швейка», фабрично-народная песня. 4003 Ершов Д. «Кочегар на вахте», Волжская песня. 4004 Ершов Д. «Садочек», народная песня. 4005 Ершов Д. «Бой «Варягя» (Плещут холодные волны). 4006 Фотиади Э.П. «Гибель миноносца «Стерегущий». 4007 Ершов Д. «Песня разбойника», из песен каторги. 4008 Ершов Д. «Завет блатного вора», из песен каторги. 4011 Бобров И.Н. «Кольцо души-девицы». 4012 Бобров И.Н. «В голове моей мозг изсыхает». 4014 Бобров И.Н. «Прощай, мой сын». 4015 Бобров И.Н. «Как во «Вяземском» трактире», босяцкая песня. 4016 Бобров И.Н. «Как под яблонькой». 4017 Бобров И.Н. «Последний день красы моей». 4018 Бобров И.Н. «Уродилась я». 4019 Бобров И.Н. «Скажи же товарищ, зачем в рудники ты попал». 4020 Бобров И.Н. «Измученный, истерзанный, наш брат мастеровой». 4022 Бобров И.Н. «Очаровательные глазки». 4023 Бобров И.Н. «Что бояться ласки». 4024 Бобров И.Н. «Еду ль ночью». 4026 Бобров И.Н. «Вечер поздно из лесочка». 4027 Бобров И.Н. «Аль опять не видать». 4028 Бобров И.Н. «Ах ты сад, ты мой сад». 4029 Бобров И.Н. «Среди долины ровные». 4030 Бобров И.Н. «Ах, кумушка». 4031 Бобров И.Н. «Знаю, ворон, твой обычай». 4032 Бобров И.Н. «Под ракитою зелёной». 4033 Бобров И.Н. «Спишь ты, спишь, моя родная». 4034 Бобров И.Н. «Хаз Булат удалой». 4035 Бобров И.Н. «Любила Маруся друга своего». 4036 Бобров И.Н. «Я чахоткою страдаю». 4037 Бобров И.Н. «Паша ангел непорочный». 4038 Бобров И.Н. «Ах ты, доля», каторжная песня. 4039 Бобров И.Н. «Укажи мне такую обитель». 4041 Бобров И.Н. «Окрасился месяц багрянцем». 4042 Бобров И.Н. «Карие глазки». 4044 Бобров И.Н. «То не ветер ветку клонит». 4045 Бобров И.Н. «Под вечер осенью ненастной». 4046 Бобров И.Н. «Ах, зачем эта ночь». 4048 Бобров И.Н. «Горе ты, горюшко». 4049 Бобров И.Н. «Москва», романс Деккер-Шенка. 4050 Бобров И.Н. «Хуторок» (За рекой на горе), песня Дюбюка. 4051 Бобров И.Н. «Было дело под Полтавой», солдатская песня. 4052 Бобров И.Н. «Ах ты, зимушка, зима», солдатская песня. 4053 Бобров И.Н. «Последний нынешний денёчек», рекрутская песня. 4054 Бобров И.Н. «Шумел, горел пожар Московский», историческая пес ня. 4056 Бобров И.Н. «Когда я рос свободный мальчик». 4057 Бобров И.Н. «Бродяга», песня каторги. 4058 Бобров И.Н. «Солнце всходит и заходит», из драмы «На дне» М.Горького. 4059 Бобров И.Н. «Стенька Разин». 4060 Бобров И.Н. «Среди лесов дремучих». 4064 Бобров И.Н. «Светит месяц». 4065 Бобров И.Н. «Гибель «Варяга». 4067 Бобров И.Н. «Волжская тройка», с акк. балалайки. 4068 Бобров И.Н. «Ухарь купец». 4069 Бобров И.Н. «На паперти Божьего храма». 4071 Бобров И.Н. «Не брани меня, родная». 4072 Бобров И.Н. «Сгубили меня твои очи». 4073 Бобров И.Н. «Умер бедняга». 4075 Бобров И.Н. «Маруся отравилась». 4076 Бобров И.Н. «Сухая корочка». 4077 Бобров И.Н. «Бой «Варяга». 4079 Бобров И.Н. «Запрягу я тройку борзых». 4080 Бобров И.Н. «Бывали дни весёлые». 4081 Бобров И.Н. «Погиб я, мальчишка». 4083 Бобров И.Н. «Златые горы». 4084 Бобров И.Н. «Зачем ты, безумная, губишь». 4085 Бобров И.Н. «Стенька Разин и княжна». 4086 Бобров И.Н. «Под небом Сербии родимой». 4087 Бобров И.Н. «Застольная здравица». 4088 Бобров И.Н. «У старушки старой», с бубном и свистом. 4089 Бобров И.Н. «Деньги дело нажитое». 4090 Бобров И.Н. «Любовь атамана». 4091 Бобров И.Н. «Весёлая казёнка». 4092 Бобров И.Н. «Хороша наша деревня». 4093 Бобров И.Н. «Прощайте ласковые взоры». 4094 Бобров И.Н. «Вот на пути село большое». 4095 Бобров И.Н. «Белый день занялся». 4096 Бобров И.Н. «Накинув плащ». 4097 Бобров И.Н. «От павших твердынь Порт-Артура». 4098 Бобров И.Н. «Отворите окно, отворите». 4101 Ярославцев В.Е. «Сухая корочка», с гитарой. 4102 Ярославцев В.Е. «Могила», с гитарой. 4103 Ярославцев В.Е. «Деревенская троечка», с гитарой. 4104 Ярославцев В.Е. «Посылала Ваню мать», с гитарой. 4105 Ярославцев В.Е. «Канава ты, канава», песня Рязанской губернии, с гитарой. 4106 Ярославцев В.Е. «По улице мостовой», с гитарой. 4107 Ярославцев В.Е. «Была бы только ночь темней», песнь разбойника, с гитарой. 4108 Ярославцев В.Е. «Голова ль ты моя удалая», песнь узника, с гитарой. 4109 Ярославцев В.Е. «Настя и Миша», старинная песня, с гитарой. 4110 Ярославцев В.Е. «Московская тройка», с гитарой. 4111 Ярославцев В.Е. «Памяти Скобелева», солдатская песня, с гитарой. 4112 Ярославцев В.Е. «В долине Дагестана», солдатская песня, с гитарой. 4113 Ярославцев В.Е. «Маруся отравилась», ново-фабричная песня, с гитарой. 4114 Ярославцев В.Е. «Маруся отравилась», окончание, с гитарой. 4115 Ярославцев В.Е. «Воет ветер на кладбище», с гитарой. 4116 Ярославцев В.Е. «Маша», с гитарой. 4133 Рябинин И.К. «На пригорке земляничка». 4151 Волгин И.Л. «Ну, быстрей летите, кони». 4152 Волгин И.Л. «Пожар Московский». 4161 Константинов В.К. «Ходит ветер у ворот». С орк. балалаек. 4162 Константинов В.К. «На дворе туман». С орк. балалаек. 4163 Константинов В.К. «Мальвина». С орк. балалаек. 4164 Константинов В.К. «Ни велика, ни мала». С орк. балалаек. 4165 Константинов В.К. «Парня в даль с дровами услали». С орк. балалаек. 4166 Константинов В.К. «Нигде милого не вижу». С орк. балалаек. 4167 Константинов В.К. «Час да по часу день проходит». С орк. балалаек. 4168 Константинов В.К. «Калина». С орк. балалаек. 4201 Бобров И.Н. «Ты склони свои чёрные кудри». С аккомп. баянистов. 4202 Бобров И.Н. «Кого люблю, того здесь нет». С аккомп. баянистов. 4203 Бобров И.Н. «Бульваром я шёл торопливо». С аккомп. баянистов. 4204 Бобров И.Н. «Изменила». С аккомп. баянистов. 4205 Бобров И.Н. «Меж высоких хлебов». С аккомп. баянистов. 4206 Бобров И.Н. «Бедный Пантелей». С аккомп. баянистов. 4207 Бобров И.Н. «О Боже, свободы я лишился». С аккомп. баянистов. 4208 Бобров И.Н. «Окованный цепями». С аккомп. баянистов. 4501 Артамонов Н. «Риголетто», Дж.Верди. Баллада Герцога. 4502 Артамонов Н. «Звучал твой голос»., романс. 4503 Артамонов Н. «Не верь», романс Петрова. 4504 Артамонов Н. «Не оставь меня», неаполитанская песенка. 4531 Ганф Энрико «Паяцы», Р.Леонкавалло. Ариозо Канио: Смейся, паяц. 4532 Ганф Энрико «Жидовка», Ф.Галеви. Рахиль, ты мне дана. 4533 Ганф Энрико «Северная звезда», М.Глинки. 4535 Ганф Энрико «Пиковая дама», П.Чайковский. Прости, небесное созданье. 4536 Ганф Энрико «Пиковая дама», П.Чайковский. Что наша жизнь. 4537 Ганф Энрико «Сельская честь», П.Масканьи. Застольная песня (на итал. яз). 4538 Ганф Энрико «Тосмка», Дж.Пуччини. Ария (на итал. яз). 4539 Ганф Энрико «Андре Шенье», Дж.Джиордано. Импровизо (на итал. яз). 4540 Ганф Энрико «Кармен», Ш.Гуно (на итал. яз). 4541 Ганф Энрико «Испанское болеро», неаполитанская песенка. 4542 Ганф Энрико «Май», неаполитанская песенка. 4543 Ганф Энрико «Уста мои молчат», романс Ю.Блейхмана. 4544 Ганф Энрико «Думка», малороссийская песня. 4545 Ганф Энрико «О соле мио» (Моё солнышко), на итал. яз. 4546 Ганф Энрико «Ты моё утро», В.Врангель. 4561 Ростан Д. «Фауст», Ш.Гуно. Привет тебе, приют невинный. 4562 Ростан Д. «Кармен», Ж.Бизе. Видишь, как свято сохраняю». 4563 Ростан Д. «Аида», Дж.Верди. Милая Аида. 4564 Ростан Д. «Дубровский», Э.Направник. О, дай мне забвенье. 4565 Ростан Д. «Трубадур», Дж.Верди. Стретта. 4566 Ростан Д. «Тоска», Дж.Пуччини. Таинственная гармония. 4591 Калинин В.М. «Дубровский», Э.Направник. О, дай мне забвенье. 4592 Калинин В.М. «Искатели жемчуга», Ж.Бизе. В сияньи ночи лунной. 4631 Фёдоров Г.В. «Фаусть», Ш.Гуно. Серенада Мефистофеля. 4632 Фёдоров Г.В. «Фауст», Ш.Гуно. Куплеты Мефистофеля. 4633 Фёдоров Г.В. «Роберт Дьявол», Дж.Мейербер. Ария Бертрама: Сонм юных девы. 4634 Фёдоров Г.В. «Мефистофель», А.Бойто. Баллада о мире. 5501 Адельгейм Роберт «Казнь», драма. Бокала звон. 5503 Пронский Б.З. «Королева бриллиантов», оперетта. Ария Олега: Взошла уже луна. 5504 Пронский Б.З. «Королева бриллиантов», оперетта В.Валентинова. Баллада Олега. 5505 Пронский Б.З. «Прекрасная Елена», Ж.Оффенбах. Ария Париса: Три богини. 5506 Пронский Б.З. «Братья Штробиндер», оперетта. Не, поцелуй не грех. 5507 Пронский Б.З. «Осенний сон», вальс Джойса. 5508 Пронский Б.З. «Ты говорила вчера», романс. С виолончелью. 5509 Пронский Б.З. «Король веселится», оп-та Нельсона. Куплеты: Жить в стране у нас. 5510 Пронский Б.З. «Редкая парочка», оп-та Царера. Забывая жизни прозу. 5511 Пронский Б.З. «Василёчек», песня А.Чернявского. С хором. 5512 Пронский Б.З. «Не развеять мне грусти», романс. С хором. 5521 Бобров А.Е. «Ночь любви», В.Валентинов. Не ходите вы, девицы. 5522 Бобров А.Е. «Пожалей», романс Н.Бакалейникова. 5523 Бобров А.Е. «Крамбамбули», студенческая песня. 5524 Бобров А.Е. «Из страны, строаны далёкой», студенческая песня. 5525 Бобров А.Е. «Не скажу я тебе», романс Ржевской. 5526 Бобров А.Е. «Не для меня придёт весна», романс Я,Пригожего. 5527 Бобров А.Е. «Уходи», романс Н.Зубова. 5528 Бобров А.Е. «Соколики», песня А.Чернявского. 5529 Бобров А.Е. «Утро туманное», романс В.Абазы. 5530 Бобров А.Е. «Спите, орлы боевые», романс И.Корнилова. 5532 Ренэ Франческо «Фуникули-фуникуля», неаполит. песня (на итал. яз). С орк. манд. 6001 Сорокина Катюша «Снова пою», романс З.Семёнова. 6002 Сорокина Катюша «Плакучие ивы», ромнс Б.Б. 6003 Сорокина Катюша «Чайка», романс Е.Жураковского. 6004 Сорокина Катюша «Отойди», романс А.Давыдова. 6005 Сорокина Катюша «В одни глаза я влюблена», романс А.Вилинского. 6006 Сорокина Катюша «Оставь его», романс М.Шишкина; «Вы его пленили», цыг романс. 6007 Сорокина Катюша «Жалобно стонет», романс Д.Михайлова. 6008 Сорокина Катюша «К чему скрывать», романс А.Денисьева. 6801 Шумов С.В. «На старом кургане», романс В.Калинникова. 6803 Шумов С.В. «Последний рейс», скандинавская песенка Е.Альнеса. 6804 Шумов С.В. «О, если б мог выразить в звуке», романс Л.Малашкина. 6805 Шумов С.В. «Ах ты, жизнь», песня Н.Фёдорова. 6806 Шумов С.В. «Не развеять мне грусти «, песня Н.Фёдорова. 6807 Шумов С.В. «Где ты, молодость», песня Н.Фёдорова. 6808 Шумов С.В. «Личико кроткое, глазки печальные», песня Н.Фёдорова. 6809 Шумов С.В. «Родная песня», романс Н.Фёдорова. 6810 Шумов С.В. «Вернись», романс Л.Денцы. 6811 Шумов С.В. «Князь Игорь», А.Бородина. Песнь Владимира Галицкого. 6813 Шумов С.В. «Сомнамбула», В.Беллини. Кавата Графа: Вновь вижу вас. 6815 Шумов С.В. «Жизнь за царя», М.Глинки. Ария Сусанина: Ты придёшь, моя заря. 6816 Шумов С.В. «Фауст», Ш.Гуно. Каватина Фауста. 6817 Шумов С.В. «Садко», Н.Римского-Корсакова. Песня Варяжского гостя. 6818 Шумов С.В. «Князь Игорь», А.Бородина. Ария Князя: Ты одна голубка. 6919 Шумов С.В. «Фауст», Ш.Гуно. Куплеты Мефистофеля. 6820 Шумов С.В. «Фауст», Ш.Гуно. Заклинание цветов. 6821 Шумов С.В. «Демон», А.Рубинштейна. Ария Демона: Я тот, которому внимала. 6822 Шумов С.В. «Дон Карлос», Дж.Верди. Ария Филиппа: Усну один. 6823 Шумов С.В. «Русалка», А.Даргомыжского. Ария Мельника. 6824 Фёдоров Г.В. «Жизнь за царя», М.Глинка. Ария Сусанина: Чуют правду. 6825 Фёдоров Г.В. «Фауст», Ш.Гуно. Серенада Мефистофеля. 6826 Фёдоров Г.В. «Фауст», Ш.Гуно. Куплеты Мефистофеля. 6827 Фёдоров Г.В. «Роберт Дьявол», Дж.Мейербера. Ария Бертрама: Сонм юных дев. 6828 Фёдоров Г.В. «Мефистофель», А.Бойто. Баллада о мире. 7001 Сорокина Катюша «Снова пою», романс З.Семёнова. 7002 Сорокина Катюша «Плакучие ивы», ромнс Б.Б. 7003 Сорокина Катюша «Чайка», романс Е.Жураковского. 7004 Сорокина Катюша «Отойди», романс А.Давыдова. 7005 Сорокина Катюша «В одни глаза я влюблена», романс А.Вилинского. 7006 Сорокина Катюша «Оставь его», романс М.Шишкина; «Вы его пленили», цыг романс. 7007 Сорокина Катюша «Жалобно стонет», романс Д.Михайлова. 7008 Сорокина Катюша «К чему скрывать», романс А.Денисьева. 7009 Сорокина Катюша «О, позабудь», романс Т.Котляревской. 7010 Сорокина Катюша «Хризантемы», романс А.Радошевской. 7027 Вечерова-Дальская Е.Д. «Врёшь, врёшь», цыганский романс. 7028 Вечерова-Дальская Е.В. «Уголок». цыганский романс. 7029 Вечерова-Дальская Е.В. «Серенада», цыганский романс. 7030 Вечерова-Дальская Е.В. «Досвиданья», цыганский романс. 7031 Вечерова-Дальская Е.В. «Плюнь на всё», цыганский романс. 7041 Мартынова Б. «Золотым кольцом сковали», песня А.Чернявского. 7042 Мартынова Б. «Не подходи», романс. 7051 Мурина М.А. «Спой мне, родимая, песню», Э.Длусский. 7052 Мурина Б. «Твоя», романс Бома. 7053 Николаева Т.М. «У могилы матери». С аккомп. орк. гармоний. 7054 Николаева Т.М. «Маруся отравилась». С аккомп. орк. гармоний. 7067 Бородина Е.К. «Помню, я ещё молодушкой была». 7068 Бородина Е.К. «Вечер, поздно из лесочка». 7999 Завадская А. «Жница», пародия. 8000 Завадская А. «Зец», комические куплеты. 8001 Пронский Б. , Немчинова Ф. «Королева бриллиантов», В.Валентинов. Песнь Тореадора. С орк. 8002 Пронский Б. , Немчинова Ф. «Вице-адмирал», оперетта К.Миллекера. Свадебная поездка. С орк. 8003 Пронский Б. , Немчинова Ф. 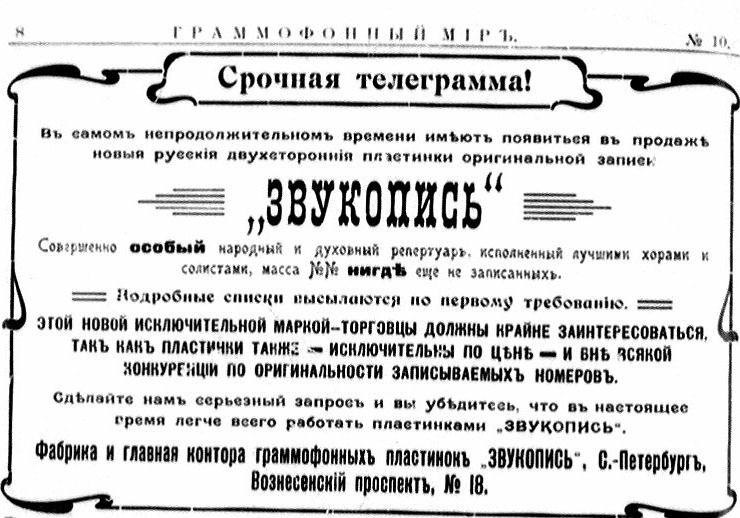 «Граф Люксембург», Ф.Легара. Ты будешь маленькой женой. С орк. 8004 Пронский Б. , Немчинова Ф. «Принцесса долларов», Лео Фалля. Дуэт Лэзи и Ганса. С орк. 8005 Пронский Б. , Немчинова Ф. «Пожиратель дам», Г.Эйслера. Польку, польку потанцуем. С орк. 8006 Пронский Б. , Немчинова Ф. «Ночь любви», В.Валентинова. Принцесса и Барон. С орк. 8007 Пронский Б. , Немчинова Ф. «Птички певчие», Ж.Оффенбаха. Сигидтлья. С орк. 8008 Пронский Б. , Немчинова Ф. «Мартин Рудокоп», К.Целлера. Ах, оставьте. С орк. 8301 Смирнов А и Смирнова Е. «Мы с Машуткой вдвоём», комические куплеты. 8302 Смирнов А и Смирнова Е. «Тру-ля-ля», комические куплеты. 8303 Смирнов А и Смирнова Е. «Фу ты, ну-ты!», комические куплеты. 8304 Смирнов А и Смирнова Е. «Машутка и Ванюха», комические куплеты. 8351 Жуков Пётр и Орлов Павел «Шишечка», комические куплеты. 8352 Жуков Пётр и Орлов Павел «Грибочки», псковская песня. 8353 Жуков Пётр и Орлов Павел «Дунюша», комическая песенка. 8354 Жуков Пётр и Орлов Павел «Деньги, деньги», комическая песенка. 8355 Жуков Пётр и Орлов Павел «Конец гулянью», комические куплеты. 8356 Жуков Пётр и Орлов Павел «Семеро на одного», комические куплеты. 8501 Смирнов А.Ф. «Эх, Дунай мой, Дунай», комические куплеты. С балалайкой. 8502 Смирнов А.Ф. «Домна», комическая песня. С балалайкой. 8503 Смирнов А.Ф. «Терёха», бытовая песня. С балалайкой. 8504 Смирнов А.Ф. «Доля, моя доля»№, русская песня. С балалайкой. 8505 Смирнов А.Ф. «Коробочка», русская песня. С балалайкой. 8506 Смирнов А.Ф. «Ухарь купец», песня Ф.Садовского. С гармонью. 8507 Смирнов А.Ф. «Парень Митька», комические куплеты. 8508 Смирнов А.Ф. «Опоздал», комические куплеты. 8521 Орлов П.Д. и Жуков П.Ф «Саратовская рекрутская. С гармоникой. 8531 Орлов П.Д. и Жуков П.Ф «Новгородская частушка». С гармонью. 8533 Орлов П.Д. и Жуков П.Ф «Шумел, горел пожар Московский», комич. частушка. С гармонью. 8534 Орлов П.Д. и Жуков П.Ф «Московс кая тройка», народная песня. С гармонью. 8535 Орлов П.Д. и Жуков П.Ф «Московская жидкая селяночка». С гармонью. 8536 Смирнов А.Ф. «Новая псковская частушка». 8537 Орлов П.Д. и Жуков П.Ф «Час да по часу день проходит». С гармонью. 8538 Орлов П.Д. и Жуков П.Ф «Грибок». С гармонью. 8539 Орлов П.Д. и Жуков П.Ф «Окрошка». 8540 Орлов П.Д. и Жуков П.Ф «Чем мой грош не хорош». 8541 Орлов П.Д. и Жуков П.Ф «Под кустиком». 8542 Хор Лебедева Г.М. «В лес по малину». 8553 Арсиков А.И. «Петербургский обыватель». 8554 Арсиков А.И. «Штиблеты», комические куплеты. 8555 Арсиков А.И. «Осторожный куплетист». 8556 Арсиков А.И. «Песни в лицах». 8560 Стрешнев «Я люблю замужних». 8565 Сурин-Задунайский «В отдельном купе». 8591 Пронский Б.З. «Каролина», муз. Скотта. 8592 Пронский Б.З. «Синьорита», модная шансонетка Кристинэ. 9001 Богемский Д.А. «Еврейская свадьба», комическая сценка с оркестром. 9002 Богемский Д.А. «Еврей у врача», юмористический рассказ. 9003 Богемский Д.А. «Свадьба в гавани». комическая сценка с оркестром. 9004 Богемский Д.А. «Прогулка по морю», комическая сценка с оркестром. 9005 Богемский Д.А. «В балагане», комический рассказ с оркестром. 9006 Богемский Д.А. «Курьёзная история», комический рассказ. 9007 Богемский Д.А. «Роза», комический рассказ. 9008 Богемский Д.А. «Сват», комическая сценка. 9009 Богемский Д.А. «Купцы на пароходе», комическая сценка. 9010 Богемский Д.А. «Путешествие по Волге», комический рассказ. 9011 Богемский Д.А. «На фу-фу», комические куплеты. 9012 Богемский Д.А. «Изюминки не хватает», комические куплеты. 9013 Богемский Д.А. «Сцена в бане». 9014 Богемский Д.А. «Качка на пароходе», рассказ. 9031 Смирнов А.Ф. «Все будем там», комический рассказ. 9032 Смирнов А.Ф. «У трамвая», комическая сценка. 9033 Смирнов А.Ф. «Денщик перепутал», комический рассказ. 9034 Смирнов А.Ф. «Строгая жена», комическая сценка. 9036 Смирнов А.Ф. «Находчивая кухарка», комический рассказ. 9037 Смирнов А.Ф. «Солнечное затмение 4 апреля 1912 года». 9038 Смирнов А.Ф. «Проводы поезда», комическая сценка. 9051 Смирнов А.Ф. «У трамвая», комическая сценка. 9052 Смирнов А.Ф. «Все будем там», рассказ из деревенского быта. С балалайкой. 9089 Каскадов И.Я. «Сподобилась»; «Не помогло». 9090 Каскадов И.Я. «За здравие и за упокой». 9091 Каскадов И.Я. «Ваня плачет»; «У тюрьмы». 9092 Каскадов И.Я. «В вагоне 4-го класса». 9093 Каскадов И.Я. «Роскошь»; «Доброе тпожелание». 9097 Каскадов И.Я. «Северный полюс». 9098 Каскадов И.Я. «Ум за разум»: «Благодетель». 10501 Каганский И.М. «Kol Nidrei» (Концерт Шора). С оккомпр. виолончели Викер. 10551 Копеллиович Д. «Eil Molei Rachmin». 10552 Копеллиович Д. «Aw Horachmin». 10553 Копеллиович Д. «Ihi Rozein (Roch choidosch)». 10556 Копеллиович Д. «Ato hiwdalto». 10701 Каганский, Джулио Ронкони «Hatikvo» (Гимн сионистов). 10702 Каганский, Джулио Ронкони «Durt wo die Zeder» (Скорбь Сиона). С виолончелью. 10731 Якобсон И.О. «A Briefele der mamen». 10732 Якобсон И.О. «Eili, Eili» (Main Gott). 11001 Хор Гирняка и Шама «Рэвэ тай стогнэ Днипр шырокый» (на малорксском языке). 11002 Хор Гирняка и Шама «Грэчаныкы» (на малорусском языке). 11051 Остапенко Д. «Нэ буду я жэнытысь» (на малорусском языке). 11052 Остапенко Д. «Ой, чумачэ, чумачэ» (на малорусском языке). 11053 Остапенко Д. «Ой, я чумак нэщаслывый» (на малорусском языке). 11054 Остапенко Д. «Ой, из-за горы» (на малорусском языке). 11201 Мурина-Муренко Н.А. «Дощык», песня Н.Лысенко (на малорусском языке). 11202 Мурина-Муренко Н.А. «Запорожец за Дунаем», С.Артемовского. Ой, казала мэни маты. 12001 Иосупов Хусейн «Бивифатима» (Красавица). С гармоникой. 12002 Иосупов Хусейн «Альма», романс. С гармоникой. 12003 Иосупов Хусейн «Алмагачлары» (Под яблонькой). С гармоникой. 12004 Иосупов Хусейн «Сафер-Кюи, ария. С гармоникой. 12005 Иосупов Хусейн «Иха-ха, трипака». С гармоникой. 12006 Иосупов Хусейн «Чаршав-биби» (За занавеской). С гармоникой. 12007 Иосупов Хусейн «Мусульманская песнь». С гармоникой. 12008 Иосупов Хусейн «Калфигам-бар» (Чепчик). С гармоникой. 12009 Иосупов Хусейн «Алтен-Юзик» (Золотым кольцом сковали). С гармоникой. 12010 Иосупов Хусейн «Акла-Сича» (Понапрасно, Ванька, ходишь). С гармоникой. 12011 Иосупов Хусейн «Байлар фикри» (Купеческая выдумка). С гармоникой. 12012 Иосупов Хусейн «Трактир-да» (В трактире, рассказ). С гармоникой. 15058 Аполлонский Р.Б. «Сцена с Петушковым» («Живой труп»). 15059 Аполлонский «Сцена у следователя» («Живой труп»). 15082 Пронский Б.З. «Романтическая женщина», оперетта. Песенка: Роза. Роза! 15084 Пронский Б.З. «Королева бриллиантов», В.Валентинова. Куплеты Олега. 15085 Пронский Б.З. «Милашка», оперетта. Песнь Красотки. 15087 Адельгейм Р. «Казнь», драма. Бокала звон. 15088 Пронский Б.З. «Наши Дон-Жуаны», оперетта. Ария Альфреда: Дамы. 15090 Пронский Б.З. «Королева бриллиантов», В.Валентинова. Баллада Олега. Мне досталась пластинка от "Русского Акционерного Общества Граммофонов" : исполнитель Бобров И.Н., "Ты склони свои чёрные кудри", и "Кого люблю, того здесь нет", гармонь. Очень хотелось бы узнать: хотя бы ориентировочно её год выпуска и немного об исполнителе. Я это для детей собираю. Помогите мне, пожалуйста. Я полагаю, речь идёт об этой пластинке. По данным П.Н.Грюнберга запись сделана в 1912 году. Исполнитель - Иван Николаевич Бобров. К сожалению, мне про него ничего не известно кроме того, что он много записывался на грампластинках.